February, the shortest month of the year, is the only month that has a varying number of days. Just about every four years, the world experiences Leap Day in order to keep God’s calendar lined up with man’s calendar. 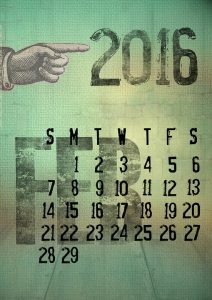 Leap day is always celebrated on February 29th, and has been for many years. The Egyptians were one of the first to realize the need for a Leap Day. February 29th is the 60th day of the year. It is not certain as to why only this date becomes Leap Day, but it has been that way since leap years originated. Leap years did not begin in Europe until Julius Caesar’s time. Julius Caesar created a calendar along with an astronomer of his day with 12 months and 365 days. Every 4 years, an extra day was added onto the month of February. It takes 365.242 days for the earth to take one full orbit around the sun. There was a problem with the Julian calendar! This calendar would work if it took exactly 365.25 days to orbit the sun, but the extra .008 days, or 11 minutes, added up after many years. As a result, those using the Julian calendar would lose a whole day every 128 years! In 1582, Pope Gregory XIII realized this problem and created a calendar system of his own which we still follow today! Leap Days are now celebrated in years divisible by four. However, for years divisible by one hundred and not divisible by four hundred, no Leap Day occurs. For example, 2100 will not be a leap year, since it is divisible by 100 and not divisible by 400. Although tomorrow is not a leap day, we can look forward to the next extra day in February that is coming in 2020!